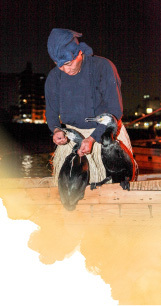 Ukai (cormorant fishing) is a traditional fishing method using "u" (Japanese Cormorant) to catch river fish. On the Nagara River, the ukai season starts at the outset of the ayu (sweetfish) fishing season, held every night from May 11th to October 15th except on the day of the harvest moon or when the river swells. Ukai begins with six long, wooden boats that are sent out to the river at dusk, each manned by an "Usho" and two boatmen. Each Usho, a mastery title granted by the Imperial Household Agency, wields amazing techniques to handle10-12 birds on leashes. The boats are equipped with a hanging fire lantern that blazes during the fishing to attract ayu. Lured to the river's surface and startled by the flames, ayu try to escape in the reflection of the light. The cormorants then dive and catch the ayu with their large beaks. The larger fish caught by the birds can be retrieved later as the cormorants are leashed loosely around their necks. Ukai requires protection to be maintained as it occupies the river. The one held on the Nagara River has been patronized and protected by the historical rulers of the time such as Oda Nobunaga and Tokugawa Ieyasu. Matsuo Basho, a great haiku poet in Japan, and even Charlie Chaplin were mesmerized by the scenery of this spectacular art. 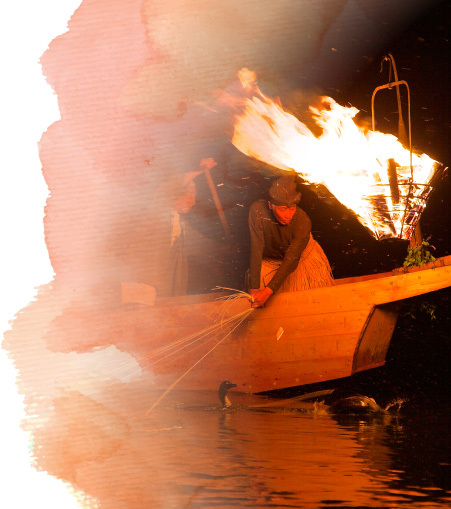 Experience the spectacle taking place under the blazing fire reflecting on the dark water. Visitors can watch ukai either freely from ashore or on an ukai viewing boat but the latter is definitely recommended in order to closely observe the skillful techniques of the master fishermen and their birds catching fish. The surrounding scenery seen on the boat is distinctively beautiful and gives you an extraordinary experience to take in. For ukai viewers, there are about 45 "yakatabune" (roofed houseboat) available on the Nagara River. They come in 5 different sizes accommodating 15 to 50 passengers. Visitors have two options in terms of their boat types: either to come aboard on regular boats with other passengers or to charter a special boat in a group but they all watch the same ukai performance. Smoking is prohibited on shared boats. Hotels and ryokans along the Nagara River offer their own "ukai package plans" that come with ukai watching, accommodation, and meals, etc. ※These package plans have 2 options: with or without accommodation. Call the Gifu City Cormorant Fishing Viewing Boat Office or reserve on their webpage. ※Food is not available on the boats but can be taken onboard. ※Travel agencies offer various tour package plans that feature ukai watching as well as booking ukai viewing boats for visitors.